In the 1990s, Falk College sport management professor, Chad McEvoy was a graduate student at the University of Massachusetts, Amherst, working closely with William A. Sutton, a distinguished academic and practitioner recognized for his visionary leadership connecting the sport marketing academic discipline to the industry. McEvoy will receive the 2014 Sutton Award from the Sport Marketing Association (SMA) —named in honor of his teacher and mentor—in recognition of exceptional contributions to sport marketing academics and the industry. The award will be presented Oct. 24 during the Annual SMA Conference, which will be held in Philadelphia. “Bill Sutton is a true pioneer in the field of sport management. As my own career transitioned from working in the sports industry to teaching and research on it, Bill has been the role model I have attempted to emulate over these past 15 years. While I feel I may never achieve the high standards Bill has set in being a true bridge between sport management industry and academia, I’m greatly honored to be recognized for my attempts to follow his lead in this area. I can’t thank Bill enough for the example he’s set and for his continued mentorship and friendship,” says McEvoy. The Sutton Award honors a sport marketing academic who exemplifies the mission of the Sport Marketing Association focused on the expansion of knowledge through connection to the sport industry. McEvoy’s outstanding research and teaching innovations include development of numerous experiential learning and purposeful networking opportunities for students that connect them with industry professionals. One example includes an ongoing partnership with the New York Yankees that blends ticket sales and strategy with hands-on learning, and collaboration with team sales management. This partnership, established in 2012, provides students the unique opportunity to learn vital skills and potentially interview for jobs. Over the past two years, the Yankees have hired more insides salespeople from Syracuse University’s sport management program than any other school. 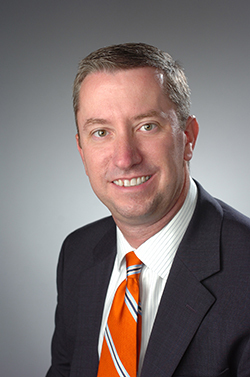 McEvoy currently serves as graduate program director in the Department of Sport Management. With his leadership, the master’s program in sport venue and event management continues to attract high-caliber students from around the world who, after completing rigorous academic and experiential requirements, launch successful careers in the industry. He joined the Falk College in August 2012 from Illinois State University, where he was a professor of sport management in the School of Kinesiology and Recreation. His primary research focus is in revenue generation in intercollegiate and professional sport. He is currently working on numerous research projects related to ticket sales strategies, ticket pricing in sports and factors affecting sport event attendance, among other topics. Earlier this month, he was named president-elect of SMA. McEvoy is co-author of two textbooks in the sport management discipline, “Financial Management in the Sport Industry” (Holcomb Hathaway, 2010) and “Research Methods and Design in Sport Management” (Human Kinetics, 2011). His research has been featured in more than 100 media outlets, such as The New York Times, The Wall Street Journal, The Chronicle of Higher Education, PBS Newshour with Jim Lehrer, New York Daily News, and USA Today. In June 2008, he served as a panelist before the prestigious Knight Commission on Intercollegiate Athletics in a discussion on the effectiveness of NCAA penalties for rules violations. With an international portfolio of publications and presentations, he is currently editor of Case Studies in Sport Management, having served previously as co-editor of the Journal of Issues and Intercollegiate Athletics. His professional affiliations include the North American Society for Sport Management and the Sport Marketing Association. At the University of Northern Colorado, McEvoy earned his Ed. D. in sport administration with a doctoral minor in applied statistics and research methods. He earned his M.S. in sport management at University of Massachusetts, Amherst, and his B.S. in sport management at Iowa State University.